We did our beach walk early this morning and were surprised at the amount of folks camping out. These folks are camped just a bit south of RV2, in front of an abandoned restaurant. 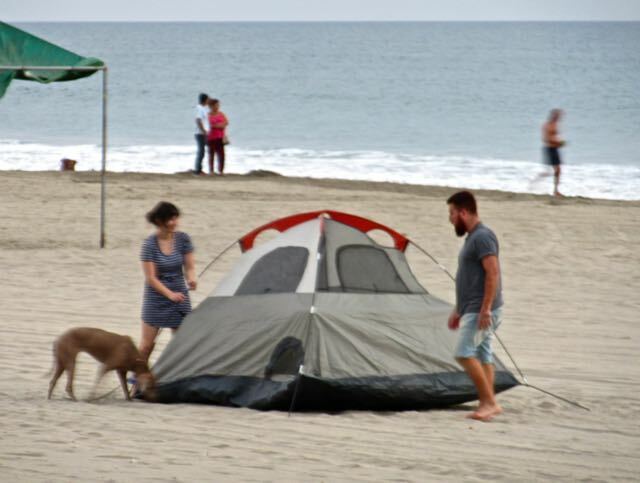 At first I thought that this tiny tent was just for two people, certainly not four. 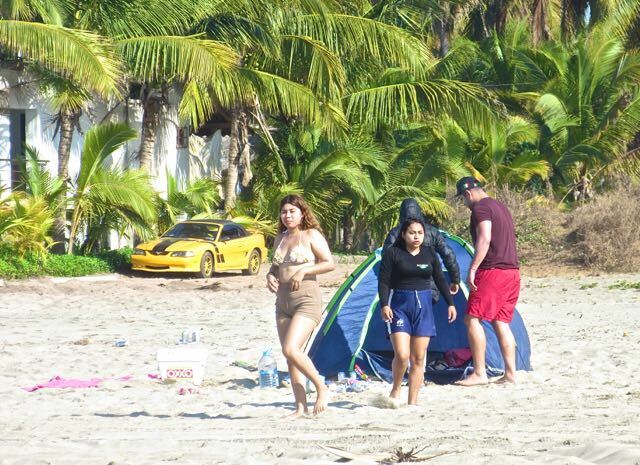 They were closer to the beach and that is their vehicle in the background but in the photo it looks closer due to compression. This was the second day that we saw this van backed onto the beach. No idea re the license plate. 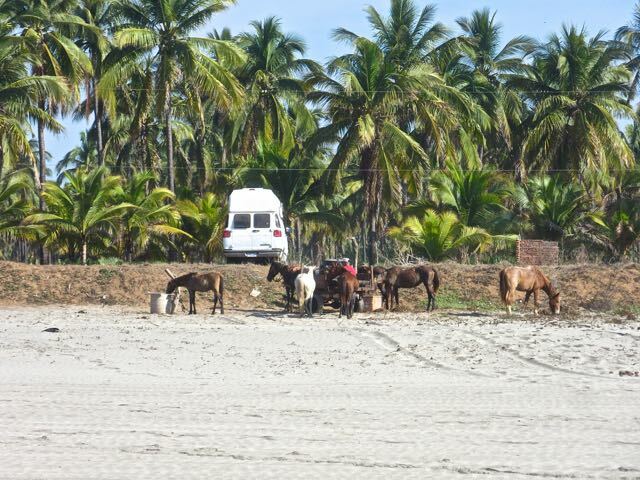 I bet he didn’t know that this was where the horses hang out for a bit every morning ( once they are brought up the beach very early morning ) until they get busy making money for their owners. This was day two as well for this tiny tent. We have not seen who resides here. Whomever it is, they are as far from the ocean as possible. A rather large group of tents not too far from the high tide line. 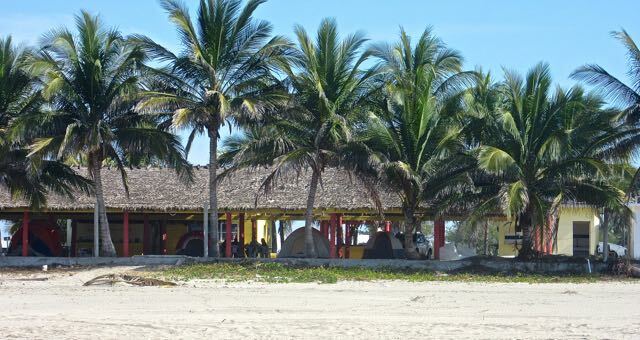 They are set up close to the old Iguana Restaurant now referred to as the fish farm. As we kept walking I was surprised to see four more tents set up under the old restaurant overhang. They were well away from the surf. Much to my surprise we had someone set up a tent tonight just in front of our RV park. 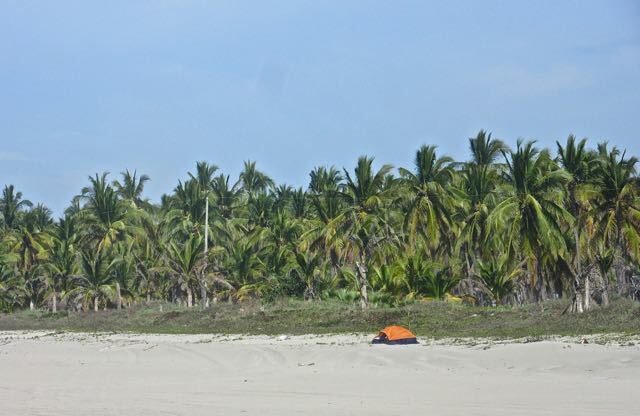 Looks like everyone there is enjoying the beach with some free camping. A nice way to travel. I don’t think they are travelers from too far away. Most are just having a short holiday. Everyone loves to be at the beach. 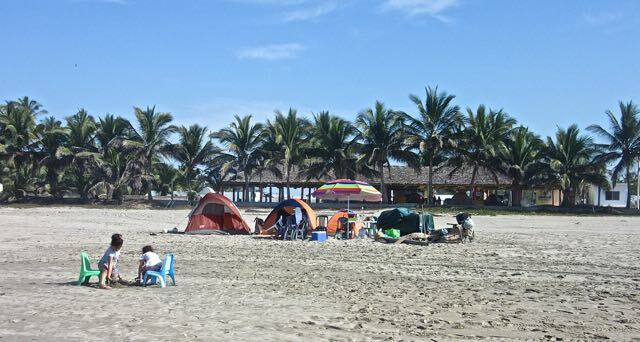 The beach belongs to all Mexicans. I like seeing the families come as it is obviously a big thing for them and a specail vacation. Looks like folks having a good time. Far from the water line and high water mark would be my choice too. Once a couple set up their tent right where the tide would come up to. We told and and they moved further back. Is there some reason tenters are suddenly appearing? Definitely something we might have done in our younger years. As long as they don’t block your view to the ocean. The weather has been nice and it was a weekend so that is why they might have come. Most of them stay just the one night. We have seen them over the years but for some reason they were scattered along the beach that day. Those guys in the tent probably feel safer being in front of people at night. Sounds like fun but I prefer my rv. Possibly. I certainly prefer my RV as well. No public facilities. Maybe as well as the ocean they crouch in the green area, on the berm, behind them. No idea what the couple in front of us did. We do have some beach vendors who simply come and pee on the wall right next to us. Sanitation must be a real concern – would worry that a hole would be dug, used and covered by those tenters – not a good thing on a public beach. And yes, there are places in Mexico where RVers do the same thing by digging a hole and letting their black and gray water run into it. Heck, there are whole communities in Mexico that let their waste go into rivers and the ocean. This is a sad part of the Mexico I love and travel. Even here in Mazatlan, as well as the capital of British Columbia, Victoria, dump their sewage into the ocean. 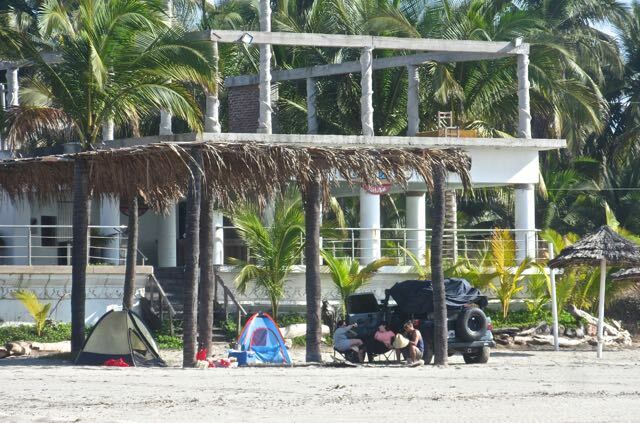 I have have heard of RVers doing this when they boondock and at one particular beach in Mexico. I have no idea but I think those tenters use the ocean.